Avery Weigh-Tronix Weigh-Tronix QC3265 Checkweigher Scale. The QC3265 does just what you need a checkweigher to do: provide fast, accurate checkweighing. 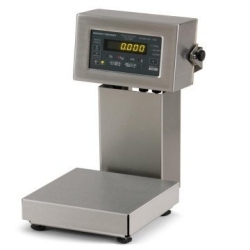 The QC3265 Checkweigher is completely washdown safe and perfect for tough environments. The foundation of the Model QC3265 Checkweigher are the patented Avery Weigh-Tronix bases, the industry standard for durability. With added rapid response time, one-stroke setup functions and simplified operation, the QC3265 does just what you need a checkweigher to do: provide fast, accurate checkweighing. The QC3265 Checkweigher is completely washdown safe and perfect for tough environments. It features stainless steel construction including base, column, load cell and NEMA 4X display enclosure. The standard display housing tilts from vertical to 20 degrees upward. The QC3265 Quick Check checkweigher from Avery Weigh-Tronix, combines rugged stainless steel construction with the proven accuracy of speciallydesigned stainless steel load cells. The foundation of the Model QC3265 Checkweigher are the patented Avery Weigh-Tronix bases, the industry standard for durability. With added rapid response time, one-stroke setup functions and simplifi ed operation, the QC-3265 does just what you need a checkweigher to do: provide fast, accurate checkweighing. The QC3265 Checkweigher is completely washdown safe and perfect for tough environments. It features stainless steel construction including base, column, loadcell and NEMA 4X display enclosure. The standard display housing tilts from vertical to 20 degrees upward. Simple setup  A single keystroke accomplishes most of the setup functions. Change target values, over and under tolerances, even units of measure in seconds. Simple operation  Uncluttered display matches the Quick Checks no-nonsense operation. Just three control keys mean short training time and minimal opportunity for human error. Five units of measure  Select to read in pounds, ounces, kilograms, grams or pounds/ounces for added versatility. Single load cell design  No moving parts for low maintenance. The QC3265 Checkweigher is completely washdown, suitable for using in typical packing house environments. It features stainless steel construction including base, column, load cell and NEMA 4x display enclosure. The standard display housing is adjustable from a vertical position to a tilt of 20 degrees. Features include: Pounds/kilograms/ounces/grams switching, adjustable tolerances, push-button target setting, push-button zero, color Under/Accept/Over LEDs, 10' load cell cable on the standard QC3265, a 10' load cell cable is standard when ordering the QC3265 with a remote display/base, 6' power cord. NTEP at 6,000d Class III.